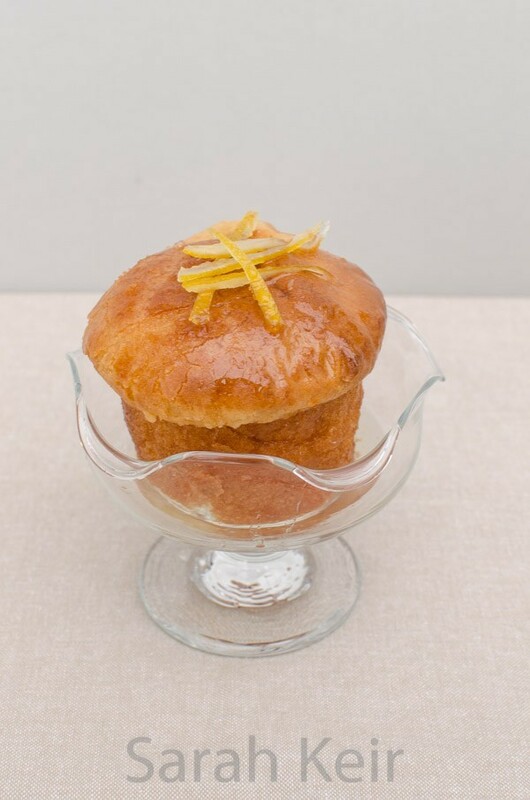 A French treat (baba au rhum) and so very retro – a fitting post for my blog when it has been such a long time since I last posted! From a limited check with work colleagues, most people seem to have heard of them but not be entirely sure they are. 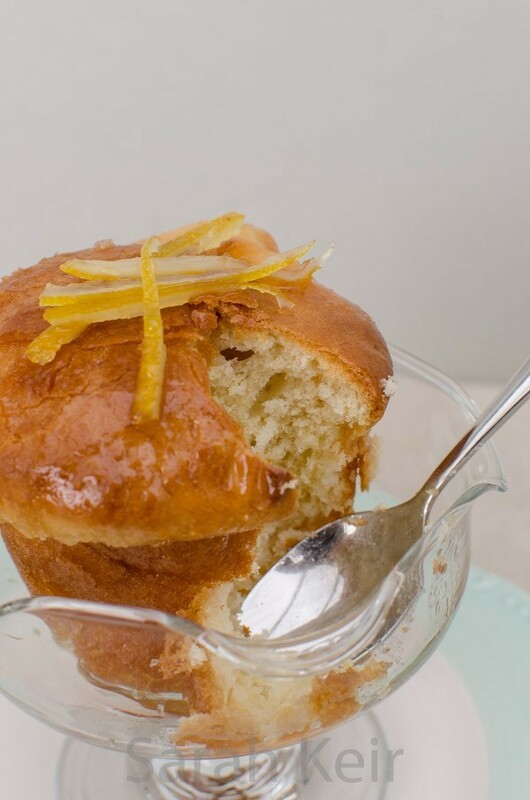 Rum babas are yeasted enriched dough cakes, soaked in a rum based sugar syrup. They are traditionally eaten in France for Sunday dinner with a good helping of chantilly cream. They seem to be making a bit of a come back so here is a post ahead of the curve! And having made them, I can say they are not something to be scared of and once you have tasted boozy sponge, you will hopefully be converted too! The enriched dough from which babas are made of is also known as a savarin dough. 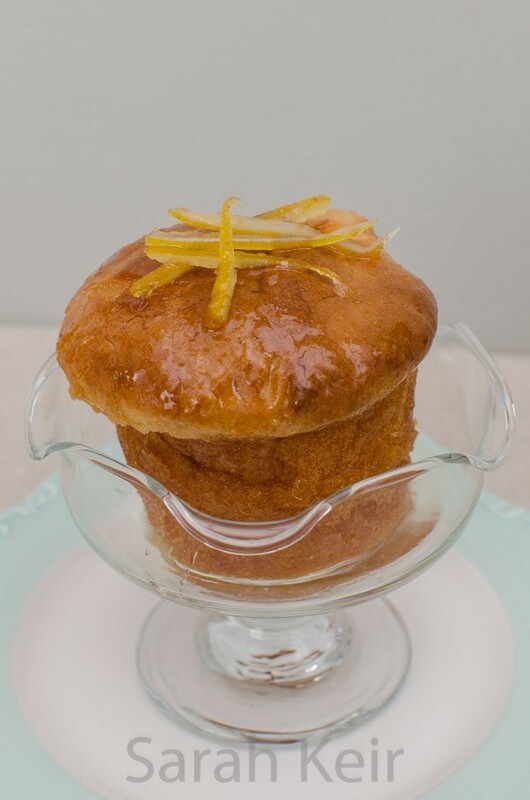 Traditional rum babas are made in small ring moulds that are known as savarin moulds, though you can also get large ring moulds and then the cake that is made is called a savarin! From internet searching, it looks like most modern chefs bake the babas in dariole moulds as these are something that most kitchens will have rather than having to buy specialist moulds. Indeed, for this recipe I made 4 traditional type babas in aluminium dariole moulds and then the rest of the dough went into a large fluted tin (it said it was a brioche tin on the label) and all turned out great. So I think the lesson for this is that it doesn’t actually matter what tins you use as a mould – how about trying individual loaf tins or tart tins (probably not loose bottom type) or even silicone moulds – you may need to adjust proving and baking times. Because this is an enriched dough, you need to know a few things about how it will behave. It will take a long time to rise and will rise better if kept warmer than you would do for bread dough as if it is too cold, the butter will firm up and the bubbles will struggle to get the rise. Professional chef websites recommend between 30°C and 40°C – I used my lizard heat mat under the bowl and then the molds and this worked perfectly. Also the dough needs a long and energetic beating to get the gluten to develop so really a stand mixer with a dough hook is pretty essential unless you have muscles like Arnie! Additionally it can be difficult to tell when done as the cake will colour quite fast in the oven. This recipe is adapted from ‘Patisserie Maison’ By Richard Bertinet. The original recipe called for fresh yeast which is a pain to find so I used the sachet instant stuff it worked out just fine. This recipes makes a lot of dough and is far too much for just half dozen babas but a mixer struggles with smaller quantities. The cooked babas freeze well or use the rest of the dough in a large tin. To make the ferment, mix the yeast into the flour and then whisk in the warm milk with a spatula or metal whisk. Cover the bowl with cling film and leave the ferment somewhere very warm for 2 hours until very bubbly – on top of a lizard heat mat is perfect. Put the ferment in the bowl of a stand mixer with a dough hook. Add all the other ingredients and beat until very elastic and silky and no sign of the butter – 10 to 20 minutes on medium. Grease the moulds well with melted butter. Pipe the mixture into the moulds until it comes about two-thirds the way up. Cover the tins in greased cling film and again place somewhere warm until risen a little above the moulds – this will take at least an hour. Preheat the oven to 190°C or 170°C if fan assisted. Take off the cling film and bake the babas in the preheated oven for 15-20 minutes for small ones and up to 40 minutes for a large one. You can tell they are cooked as a skewer will come out dry and they sound hollow when tapped underneath (just like bread). Carefully turn out onto a wire rack to cool. Then store in an airtight container for up to 2 days or freeze. For the syrup, thinly peal off the rind of the orange and lemon with a vegetable peeler or knife then cut into fine julienne strips. Squeeze the orange and lemon and put the juice into a pan with the sugar and water. Bring to the boil once the sugar has dissolved and boil for a few minutes until syrupy and the peel is tender. Take off the heat and add the rum. This can be stored in a container in the fridge for up to a week. To finish the babas place the syrup into a wide shallow dish and place in the babas. Turn them frequently and leave them to soak for a minimum of 3 hours and up to 24 hours at room temperature. Beat the cream with the sifted icing sugar until stiff peaks. Add the vanilla and give one more quick beat. Serve immediately otherwise the firmness disappears. To finish the babas, place a baba in a small dish, spoon over syrup and place some of the citrus peal on top. Serve with chilled Chantilly cream. Enjoy!